Test object: The precision bearing testing system of the mechanical and electrical engineering department of a company. customer requirement: They want to acquire rotation speed, oil temperature, vibration, inverter power and other data by a data acquisition device, upload the data in real time to an upper computer for recording and analysis, and control the motor through the controlling system. The SL1000 acquires the vibration signal and the axis orbit. The WT333E monitors the inverter output power. The MX100 records the radial load, oil temperature, rotation speed signals. The upper computer software processes and displays the data. 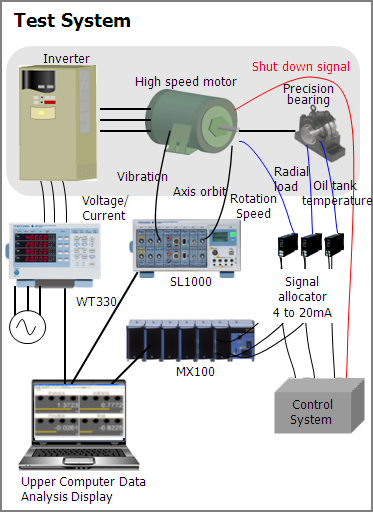 The radial load, oil temperature and rotation speed signals need to be transmitted to the controlling system simultaneously. A signal allocator is required. SL1000 high-speed recording and real-time upload function. SL1000 vibration signal acquisition function. MX100 multiple signal real-time recording and upload function. Upper computer software high-speed, low-speed data processing synchronously.